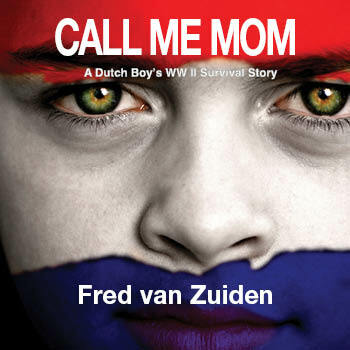 Call Me Mom is Fred Van Zuiden’s fast-paced personal story of fending for himself as a child during the World War II German occupation of Holland. Touching veterans of the war and modern-day readers alike, Fred describes surviving the Battle of Arnhem, near misses with the Gestapo, living in a chicken coop, escaping over no-man’s land, and moving between 26 hiding places to stay out of Nazi hands. Fred van Zuiden was nine when Germany invaded Holland in 1940. After enduring two years of worsening German occupation, he and his family split up and went into hiding. By the time the war ended in 1945, Fred had found refuge in 26 places and experienced the best and worst of human nature. This book is his straightforward, unsentimental account of those years during World War II. Among many tense scenarios, he vividly recounts terrifying escapes from the Gestapo as well as Arnhem-bound aircraft crashing around him. His story is populated with fellow hiders who kept him sane with gallows humour; larger-than-life Resistance fighters—selfless men who arranged his hiding places; and ordinary Hollanders who risked their lives to save him. He honours them all, especially his many ‘Moms’. Fred’s home was in Drenthe in northeast Holland where he led a safe life dominated by his father’s 200 year-old family business. After German occupation, life progressively worsened. Fred was forced into the underground and survived on his own, but not without the help from courageous Dutch people. He reunited with his father and siblings, and continued his disrupted education at a Montessori high school. He studied retail management and eventually immigrated to Canada in 1952. He worked in major cities from coast to coast and settled with his wife in Calgary, where he founded a sailboat business. He retired after forty-three years. He then set down his exhilarating sailing experiences in his first book, The Sailing Game. He was persuaded to publish the story of his equally exciting life as a boy during World War II. In March 2009, Call Me Mom appeared—his personal account of survival.